A. Thousands of belly casts have been safely made around the World over the last twenty years.However, if you feel faint or unwell at any point during yours you MUST stop. You can quickly remove the belly cast and continue or redo it later. Do not stand whilst having your belly cast made. Q. How messy is it? A. We minimise any mess by providing plastic sheeting in the deluxe kit for your floor so any mess is simply rolled up and thrown away at the end. The deluxe kit also provides plastic sheeting to tuck into the top of your knickers which also protects your legs. However, you will probably want to have a shower afterwards to remove the petroleum jelly and any plaster drips from you skin. If you have purchased the standard kit you will be advised to put down your own plastic sheeting, old towels or newspapers. Q. What is the best stage of pregnancy to make a belly cast? A. 36 to 37 Weeks. So that your belly is nice and big but you are not too uncomfortable or tired. But you can make a belly cast at any stage of pregnancy and even when you are not pregnant. A. It should take about an hour, including the preparation and clearing up time. So make sure you go to the loo first! Q. What do people do with their belly cast? A. Most people hang their belly cast on the wall of the nursery perhaps with a soft light behind it. You can also make it into a nursery light or fruit bowl if you have done your belly only. See our Belly casting gallery for inspiration. Q. Will it hurt the baby? A. 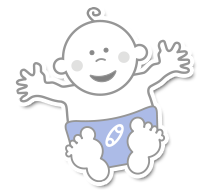 The plaster bandage does not shrink when it sets so your baby's movements will not be restricted. The belly cast is more likely to fall off or loosen than restrict you or your baby. Q. Will it hurt me? A. No, If you generously apply loads of petroleum jelly to all areas that will be cast, you should feel no discomfort when your belly cast is removed. A. Fun and relaxing. It's quite amazing when then cast is removed and you see yourself in life-size 3-D.
Q. Is it difficult to make a belly cast? A. No. Our simple instructions provide step-by-step guidance with photographs and diagrams. It's a bit like papier-mache but you get much quicker and better results. No previous artistic experience is necessary. Q. Should I be naked? A. No. You must cover your pubic hair by wearing knickers. It will cause discomfort when you remove your cast if any hair is trapped in the plaster bandage. In the deluxe kit we provide plastic sheeting (legs & knickers protector) that you can tuck into the top of your knickers to protect your pubic hair and legs. Petroleum jelly protects your skin and fine body hair. Q. Do I have to shave my body hair? A. No. Wear some knickers to protect you pubic hair. If you have purchased the deluxe kit, tuck in the legs & knickers protector provided in the kit. If you have purchased the standard kit, you could place an old towel or bin bag over your legs if you do not want them to get wet. Q. Can I stand while being cast? A. Never. You are at risk of fainting, you should sit comfortably throughout your bellycasting session. Q. Could I have an allergic reaction? A. If after performing a patch test you have a allergic reaction, try the patch test again with olive oil or good quality massage oil. Q. Do you do private casting sessions? A. Yes. A private session costs £80. Click here to go to our Belly casting sessions page. We are located very close to tube, bus and rail links in central London (zone 2) with free parking and NOT in the conjestion charge zone. Q. Can I decorate and hang my belly cast myself? A. Yes. 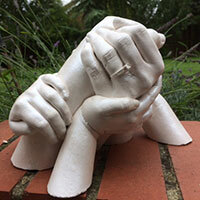 Our gallery shows you photographs of beautifully finished belly casts to inspire you. We sell belly cast decorating packs to smooth, paint, varnish and hang your belly cast. 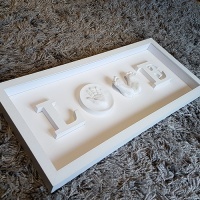 Please contact us if you would like advice on particular decorating techniques. Q. I have dropped my belly cast and it looks squashed. Can it be repaired? A. Yes. You will need some plaster bandage. If you do not have some plaster bandage left over we can post some more to you. Then cut some small strips, wet and apply to the inside of the belly cast over the break/crack. Support with your hands into the correct shape whilst the plaster sets. Leave to dry for a couple of days before decorating. Q. How should I care for my belly cast? A. Varnish your cast to offer it more protection. Do not let it get wet or damp. Lightly dust it using a feather duster. You can occasionally wipe your belly cast with a damp cloth. Q. Can I use anything other than Vaseline? A. We have researched this extensively. Vaseline does not drip so there is less chance of you or your helper slipping whilst making your belly cast. It can also be applied in quite a thick layer so there is less chance of your body hair sticking to the plaster bandage (Ouch!). Vaseline is a household name and most people have used it before so there is less chance of skin sensitivity. We have not found anything with these qualities. However, if you have strong reasons for not using petroleum products you could use any good quality massage oil with as thick a consistency as possible. Q. How do I cast my hands in the cast? A. 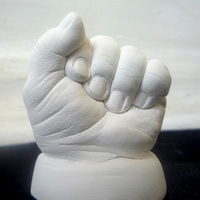 Here are a few tips to help you include your hands in your belly cast. Ensure you have your arms supported in the pose so they do not get too tired. Don't splay/spread your fingers out to much as it doesn't look quite so attractive. Don't put too many layers of plaster bandage strips over the fingers or you could lose the detail. When covering the fingers, cut strips that cover each finger in turn - about 3x10cm and take your time. Make sure your do not trap your arms in the cast and that it can be lifted off you. The more irregular shape caused by having your arms/hands in means the cast could be weaker in places and might fold in when you remove it. So make sure it is strong, hard and supported before you remove the cast.